Reddish brown to dark purple in color, sumac berries grow from a wild decorative bush, which is found in Middle Eastern countries and parts of Italy. It is sold as a dried berry or ground into a powder to be used as a spice for seasoning. It provides a fruity but sharp, tangy taste that has a hint of lemon and pepper flavoring. It goes well with meat, fish, vegetables and stews. This seasoning can be mixed with yogurt and herbs to make a tangy, fresh tasting sauce or used whole to be used as a seasoning over grilled fish and meats, or added as ground seasoning for fish, meats, vegetables, and stews. 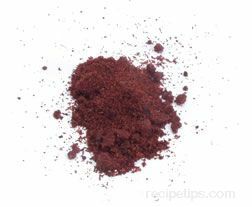 The sumac used for seasoning is not to be confused with the family of poisonious sumac common in the U.S. that contains an oil which can cause extreme skin irriation if the plant comes in contact with the flesh.